NBA – With only few games left before the regular season ends, candidates for this 2016 - 2017 NBA KIA MVP are still in tight contention. The Oklahoma City Thunder point guard Russell Westbrook still leads in the latest ranking of NBA KIA race, Westbrook is averaging almost a triple double a game this season and already posted his 33rd triple doubles, the 2nd most triple double in a single season and more likely to break the NBA record of 41 triple doubles posted by Oscar Robertson. Westbrook and his team OKC are currently 6th in Western Conference Standings. Ranking second in the MVP Race is the Houston Rockets guard James Harden which is also having a great season, Harden and Westbrook has been switching places in KIA MVP Race, for now this two are the favorite to win MVP this year. Harden has been leading the Rockets in scoring and averaging almost a triple double a game he already posted 16 triple doubles this season his most of his career and currently second in triple double this season after Westbrook. Harden and his team Rockets are currently 3rd in Western Conference Standings. Cleveland Cavaliers Superstar and 4 time MVP LeBron James is also having a great year this season, like Westbrook and Harden, LBJ also posted his career best in triple doubles with ten triple doubles this season and currently third for most this season only after J. Harden with 16 triple doubles and R. Westbrook 33 triple doubles. James is not the favorite to win in this year MVP, but there are still hopes for James to grab his 5th MVP with several games to go before the regular season ends. Currently James and his team Cavaliers ranked 1st in the Eastern Conference Standings. 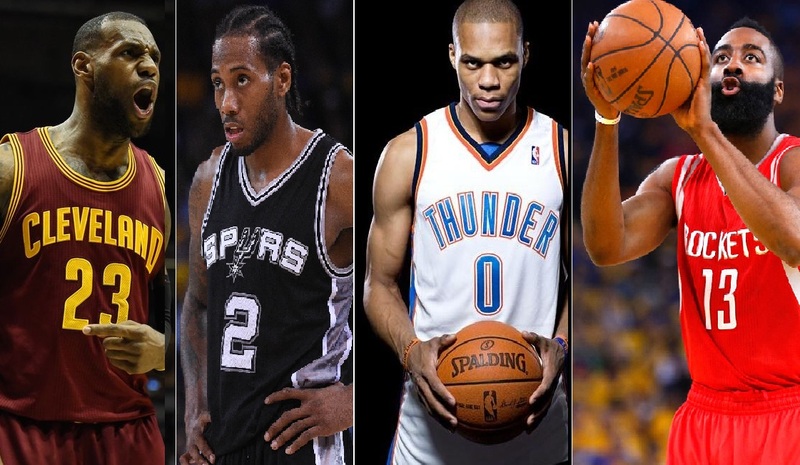 San Antonio Spurs forward Kawhi Leonard has also had a strong contentious for this year MVP Race, Leonard and his team are likely to be the top seeded team in the West and also the favorite to win in this year Western Conference Title over the Golden State Warriors. Leonard and his team Spurs currently 2nd in Western Conference Standings. Well guys, who do you think will win in this year NBA KIA MVP? No Comment to " LBJ, K. Leonard, J. Harden and R. Westbrook are in Closed Fight for this Year KIA MVP "